Last month, after soliciting input from key stakeholders and market participants, and engaging in extensive strategic planning, the MSRB established new strategic goals that will guide the organization for the next several years. The new goals emphasize the importance of data, information and education in effective regulation of the municipal securities market. 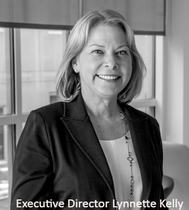 We are emerging from an intense period of rulemaking driven in part by the imperatives of the Dodd-Frank Act and the 2012 Securities and Exchange Commission Report on the Municipal Securities Market. It’s an appropriate time for the MSRB to shift its focus to, among other things, assisting regulated entities with their compliance efforts. Our updated goals prioritize initiatives such as issuing guidance, advisories and FAQs that will support that endeavor. In addition to continuing to focus on necessary market oversight and the Electronic Municipal Market Access (EMMA®) website, the new goals emphasize the MSRB’s role as a self-regulatory organization, the utility of market data and financial stewardship. We are confident these priorities represent the interests of our stakeholders and a continued path to a fair and efficient municipal securities market. I look forward to providing updates on how the MSRB is fulfilling its mission and its commitment to ensuring a fair and efficient municipal securities market. Read more about the MSRB’s new strategic goals. 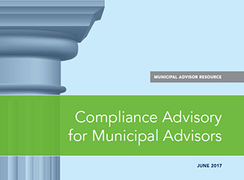 The MSRB recently provided this Compliance Advisory for Municipal Advisors to aid municipal advisor firms with understanding MSRB rules and identifying potential compliance risks. The advisory addresses applicable MSRB rules implemented since the publication of the MSRB’s first compliance advisory for municipal advisors. Keep an eye out for a similar dealer compliance advisory coming soon. A new video from the MSRB captures stories from chief financial officers, finance directors and other government leaders about how they utilize the Electronic Municipal Market Access (EMMA®) website. A second video in the series describes how these professionals use EMMA to fulfill their ongoing disclosure obligations and effectively communicate with investors. Get the latest tips from these state and local government finance professionals about using EMMA. This week, the MSRB launched a free, interactive online course to help investors understand how municipal bonds work and assess how they might fit into a balanced portfolio. The course, “Exploring Municipal Bonds: A Course for Investors,” uses real-world scenarios to show investors where to get information about municipal bonds and to highlight considerations for selecting an individual security. For more information about MuniEdPro® or to inquire about subscription options, contact Ritta McLaughlin at rmclaughlin@msrb.org or 202-838-1306. Get ready for the October 2017 changes to MSRB rules on customer complaints and related recordkeeping for municipal advisors and dealers by attending a July webinar. The free webinar will cover new annual customer/client notification requirements, as well as new electronic complaint log product and problem codes. Register here. The MSRB recently hosted two free webinars for municipal advisors that are now available on demand for one continuing education credit each. “Municipal Advisor Solicitor Guidance” covers the recently published guidance on the application of MSRB rules to solicitor municipal advisors, and “Municipal Advisor Representative Qualification Examination (Series 50 exam)” reviews the standards of professional qualification for municipal advisors and the enrollment process for taking the Series 50 exam.